eCite - Infrapatellar fat pad in the knee: Is local fat good or bad for knee osteoarthritis? 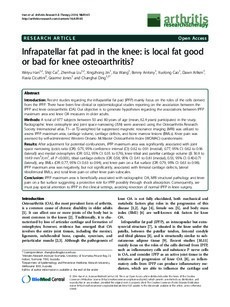 Infrapatellar fat pad in the knee: Is local fat good or bad for knee osteoarthritis? Introduction: Recent studies regarding the infrapatellar fat pad (IPFP) mainly focus on the roles of the cells derived from the IPFP. There have been few clinical or epidemiological studies reporting on the association between the IPFP and knee osteoarthritis (OA). Our objective is to generate hypotheses regarding the associations between IPFP maximum area and knee OA measures in older adults.Methods: A total of 977 subjects between 50 and 80 years of age (mean, 62.4 years) participated in the study. Radiographic knee osteophyte and joint space narrowing (JSN) were assessed using the Osteoarthritis Research Society International atlas. T1- or T2-weighted fat suppressed magnetic resonance imaging (MRI) was utilized to assess IPFP maximum area, cartilage volume, cartilage defects, and bone marrow lesions (BMLs). Knee pain was assessed by self-administered Western Ontario McMaster Osteoarthritis Index (WOMAC) questionnaire.Results: After adjustment for potential confounders, IPFP maximum area was significantly associated with joint space narrowing (odds ratio (OR): 0.75, 95% confidence interval (CI): 0.62 to 0.91 (medial), 0.77, 95% CI: 0.62 to 0.96 (lateral)) and medial osteophytes (OR: 0.52, 95% CI: 0.35 to 0.76), knee tibial and patellar cartilage volume (β: 56.9 to 164.9 mm3/cm2, all P <0.001), tibial cartilage defects (OR: 0.58, 95% CI: 0.41 to 0.81 (medial), 0.53, 95% CI: 0.40-0.71 (lateral)), any BMLs (OR: 0.77, 95% CI: 0.63 to 0.94), and knee pain on a flat surface (OR: 0.79, 95% CI: 0.63 to 0.98). IPFP maximum area was negatively, but not significantly, associated with femoral cartilage defects, lateral tibiofemoral BMLs, and total knee pain or other knee pain subscales.Conclusion: IPFP maximum area is beneficially associated with radiographic OA, MRI structural pathology and knee pain on a flat surface suggesting a protective role for IPFP possibly through shock absorption. Consequently, we must pay special attention to IPFP in the clinical settings, avoiding resection of normal IPFP in knee surgery. © 2014 Han et al. ; licensee BioMed Central Ltd.